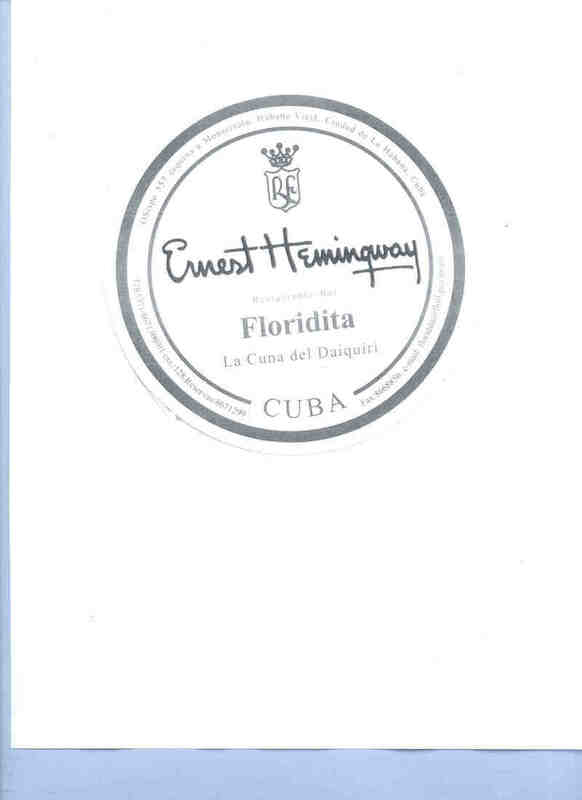 Hemingway’s love of the Daiquiri is usually traced to his favorite bar in Havana, The Florida, aka, “El Floridita;” however the above letter suggests that he’d already developed a taste for them during his Key West years, before he moved to Cuba. While living in Cuba, Hemingway became a regular at El Floridita, which was owned and manned by Constantino (Constante) Ribailagua. Hemingway didn’t like sugar in his drinks; it even showed up in his prose. In "Islands in the Stream," young Tom Hudson made a drink for his father, with the assurance, “I put lime, bitters, and no sugar in it.” As an aside, one can assume that Hemingway would be horrified at the number of frozen Daiquiri bars in his beloved French Quarter, especially (atrocity of atrocities!) the one now occupying The Old Absinthe House Bar. 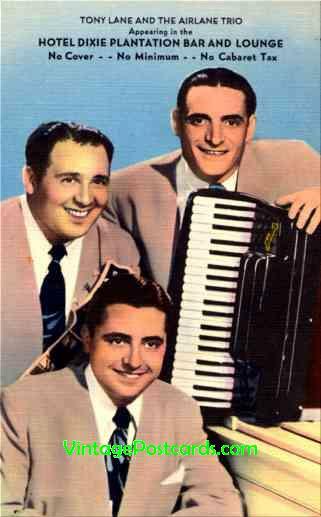 That Papa and Constante’s hand-crafted creation could have helped spawn the grain alcohol Slurpees of today would no doubt have him spinning in his grave. But I digress. Shake well and serve frappe. Please note my comment about the use of “lemon.” This is a common error in transcription, “lost in translation,” so to speak. In Cuba, the term “limon” can be used to refer to either a lemon or a lime, and to differentiate, “limon verde” is often used to specify “green lemon,” or lime. The menu itself confirms this, as the Spanish-language side of the recipe indeed calls for “Jugo 1/2 limon verde.” Gringo mixologist beware!! Hemingway’s writings were chock full of drink references. 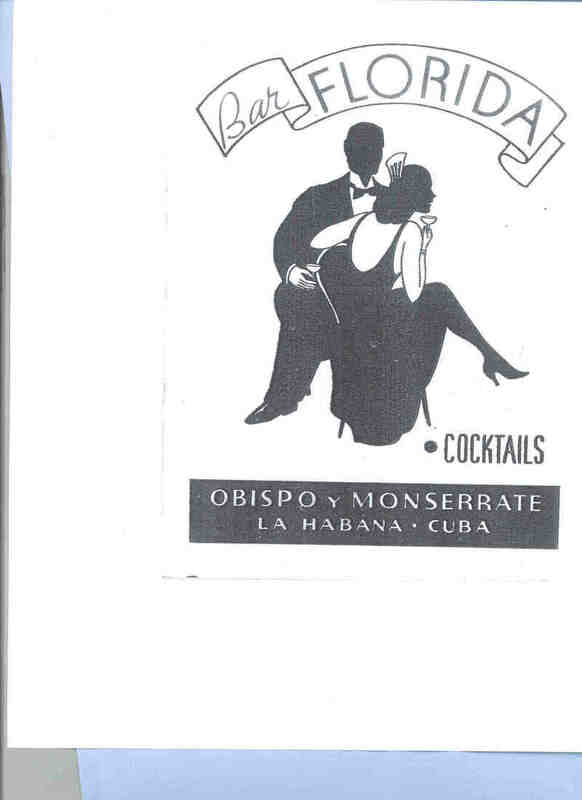 A few excerpts from the novel "Islands in the Stream:"
The Floridita was open now and he bought the two papers that were out, Crisol and Alerta , and took them to the bar with him. He took his seat on a tall bar stool at the extreme left of the bar. His back was against the wall toward the street and his left was covered by the wall behind the bar. He ordered a double frozen daiquiri with no sugar from Pedrico, who smiled his smile which was almost like the rictus on a dead man who has died from a suddenly broken back, and yet was a true and legitimate smile, and started to read Crisol. "I love it," he said out loud. "Drinking. Not just drinking. Drinking these double frozens without sugar. If you drank that many with sugar in it would make you sick." "Ya lo creo. And if anybody else drank that many without sugar they would be dead." "No, you won’t. You’ll just break the record and then we’ll go to my place and you’ll go to sleep and the worst thing that will happen is if you snore." "Did I snore last time?" "Horrores. And you called me by about ten different names in the night." As noted above, I have a special appreciation for this drink. Indeed, the rum industry has brought us several notable trademark cases over the years, including the ongoing squabbles over the name Havana Club . From a public relations standpoint, it might seem an ill-advised for Bacardi to enforce its trademark so vigorously; after all, how often do you see someone suing the users of the product, as if biting the hand that feeds you? Remind you of anything recent? It’s perhaps similar to the tactics used by the music industry, suing file swappers to prevent the unauthorized downloading of music, using peer-to-peer file sharing software. Sue your own customers? Sometimes, it actually works! So, this one dispenses with the Grenadine, and adds Angostura bitters. Frankly, I think I prefer this one, the Grenadine can be a add a bit too much sweetness, and the inclusion of the island-flavored Angostura adds a nice Caribbean flavor to the drink. Delicious! Shake well with cracked ice and strain, serve in a cocktail or wine glass. Looking for a cheap, ahem, budget hotel in the Big Apple? Try the Carter Hotel, located at 25 West 43d Street, in the heart of the Times Square/theater district, where you can get a room for about 100 clams a night. As you enter the lobby, close your eyes and envision the joint in its glory days, during the 30s, 40s and 50s, when it was the Hotel Dixie. 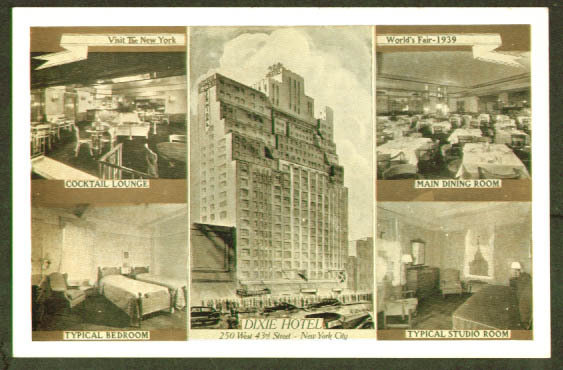 Opened in 1930 (same year as the Chrysler Building), the Dixie was one of Manhattan’s grand hotels. Just as Madison Square Garden sits atop Penn Station today, the Dixie had the Central Union Bus Terminal in the basement, with a giant turntable for the buses to change direction. A weary traveler in 1936 could be sure to find “700 attractive outside rooms each with private bath and radio.” That room would set you back $2.50 a night. But the Dixie, like many grand hotels, fell on hard times in the ‘70s, and by the ‘80s was being used as a city-run shelter for homeless families. By the ‘90s, the venerable old Plantation Room became a venue for drag queen shows, as part of a notorious Times Square nightclub called Sally's Hideaway. Let’s look at the menu, shall we? 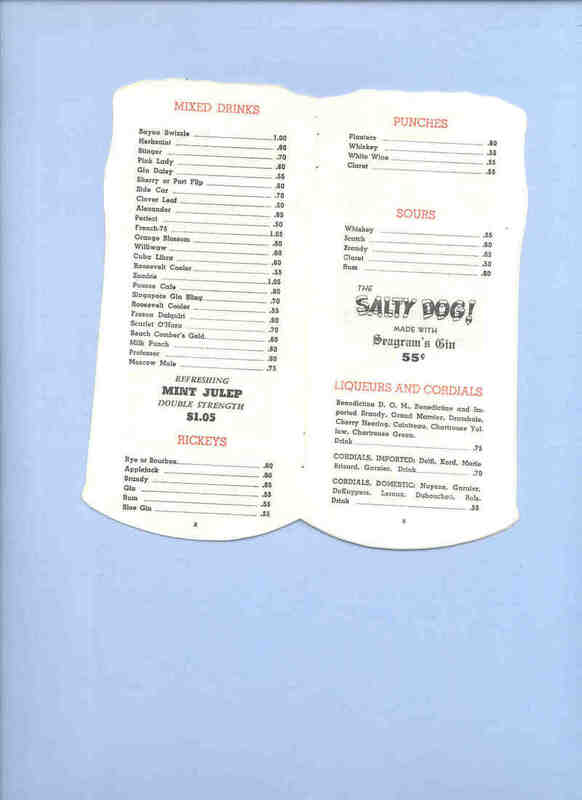 This menu is great, offering thirty, count ‘em “Thirty Popular Drinks and How to Make Them.” Since it’s summertime, let’s look at a couple of classic rum drinks, the Daiquiri and the Bacardi Cocktail. And, no, I’m not referring to the Daiquiri made from the “just add rum and people” bottled mix or the juice cans out of the freezer. Not that there’s anything wrong with those; just as pasta sauce out of a jar can be fine, but don’t kid yourself into thinking it’s authentic. I’m talking about the classic ingredients, traditional methods, making it from scratch. The differences are slight: the Daiquiri is rum, lime juice and sugar, while the Bacardi is rum, lime juice and Grenadine. Oh, make sure that’s Bacardi brand rum in the latter, or the trademark lawyers will be all over you like a cheap suit. Take it from me, I happen to be a trademark lawyer, and I’ve owned a cheap suit or two in my day. 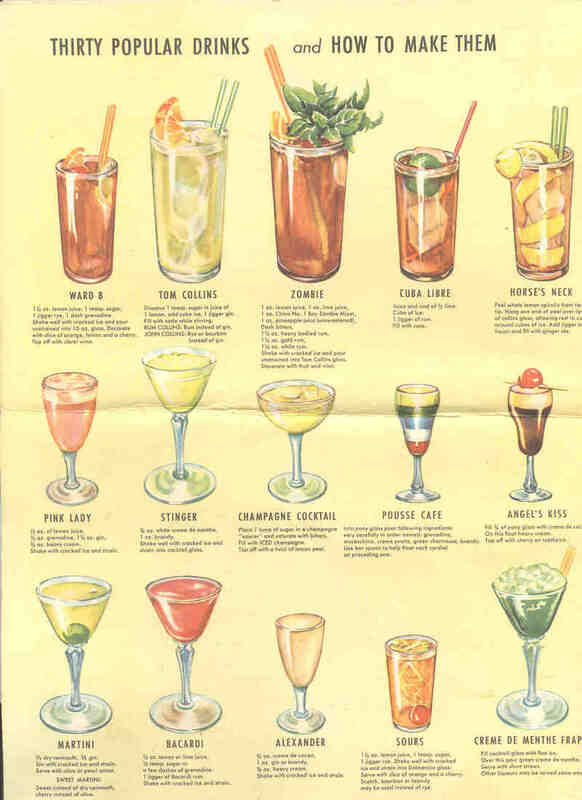 Indeed, on paper these drinks are very similar, an example of David Embury’s “Roll Your Own” theory, that drinks are made up of components, and subbing one for another will create a new drink. Using the terminology found in his classic 1948 book, "The Fine Art of Mixing Drinks," both drinks share the same base (white rum) and modifier (in this case, a sour modifier, lime juice). The difference is in the choice of sweetener. The Daiquiri uses sugar, while the Bacardi calls for Grenadine. Note: use a Grenadine made from pomegranate juice (not just fructose or corn syrup) and you’ll make better drinks, and that includes your Shirley Temples. Continuing to "Roll Your Own," you’ll see that if you start with the Daiquiri and add mint and seltzer, you’ve got a Mojito. Or, replace the rum with vodka, use Cointreau or triple sec for the sweetness, add some cranberry juice and, voila, it's a Cosmopolitan. Use brandy as the base, lemon juice as the sour and Cointreau as the sweet and it's a Side Car. Rum for the brandy and it’s a White Lady. Whiskey in place of the rum and it's a Whiskey Sour…Okay, you get my point. As with most classic drinks, there are as many stories as to the Daiquiri’s origins as theories about where Jimmy Hoffa is. Quoting Charles H. Baker, Jr., in his epic 1939 book "The Gentleman’s Companion - Being an Exotic Drinking Book or, Around the World With Jigger, Beaker and Flask," "[w]e honestly believe that more people have boasted about the origin of this happy thought than any modern drink." Baker traces the origins to the village of Daiquiri, Cuba, attributing it (as is so typical in drink folklore) to medicinal purposes. "There was fever. Doctors still thought that a lot of yellowjack malaria cases came from drinking-water and swamp mists. They couldn't turn off the swamp mists but they knew that diluted alcohol was a disinfectant against germs. So they put a little rum in their boiled drinking water. That tasted pretty bad so some bright citizen squeezed a lime into the thing, and a little sugar to modify the acid. Ice made from distilled water took the tropical heat off the thing. The 2 originators were my friend Harry E. Stout, now domiciled in Englewood, New Jersey, and a mining engineer associate, Mr. Jennings Cox. TIME: summer of 1898. PLACE: Daiquiri, a village near Santiago and the Bacardi plant, Cuba. Hence the name." Either shake very hard with finely cracked ice and pour ice and all into a tall flute cocktail glass, or put the same things into the Blender, and let frost into the delicious sherbet consistency we so admire nowadays. Never use lemon juice. And remember please, that a too-sweet Daiquiri is like a lovely lady with too much perfume." Of course, the invention of the blender brought us the frozen Daiquiri, making that version of drink as ubiquitous and predictable as the ice cream headache that accompanies it. But a frozen Daiquiri doesn’t have to be what you’ve come to expect from the Daiquiri bars (namely, syrupy sweet) if you make it from scratch. There are many variations on the classic Daiquiri recipe; CocktailDB.com offers about two dozen Daiquiri recipes. CocktailDB.com is operated jointly by Ted "Dr. Cocktail" Haigh and Martin Douderoff; Ted is the curator of the Museum of the American Cocktail, and author of the amazing and indispensable book "Vintage Spirits and Forgotten Cocktails." Among these variations, of course, is the so-called Hemingway style Daiquiri. 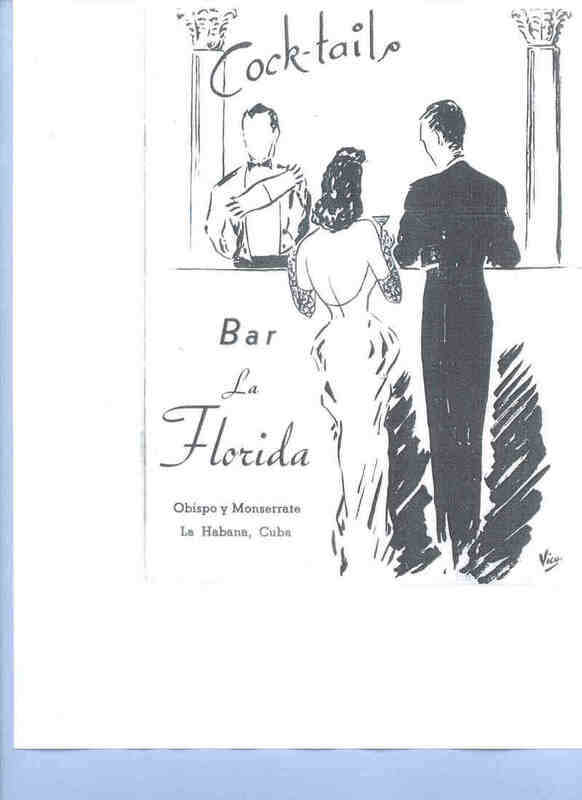 And where else to look at recipes but the source, a 1930s-era menu from the Bar La Florida in Havana, Cuba, known affectionately as El Floridita. ”I’m, uh, strictly on the water wagon, I don’t drink anymore, I quit. But of course I’m going to sample this drink to see if you’ve made it right. That’s the only purpose I’m doing it is to help you out. (here, Huey flashes a sincere look into the camera) I wouldn’t touch a drop of it (wagging his finger) if I wasn’t trying to help you, to find out if you’ve mixed it right. (Huey takes a long pull on the drink) That seems like all right (another long pull) But I won’t take except enough to sample it…, but, better be sure about it, I’ll try it a little further. (another long pull) I believe that’s all right. (another long pull) I think it’s perfectly all right (another long pull, followed by a dramatic blinking of both eyes) I’m sure it’s all right!” (finishing the drink, slamming down the glass, the crowd erupting in applause). And I, remembering that I taught Joe how to make it, said, “Well, I’ll tell you,” and I began to count off the ingredients; but as I counted them off, I realized that I had forgotten one. I could not think what it was, so I called to Joe. He came, barefooted and carrying the enormous cocktail shaker in his hand. He poured out the dividends in our glasses. “Well, I have forgotten one of the ingredients,” and I named to him the ones I remembered. Add all ingredients to shaker along with some large lumps of ice. If it’s a large shaker, add the seltzer now, if smaller, do so later (or the effervescence will foam over). Shake like hell for at least 3 minutes (in my cocktail seminars, we shake for the duration of Elvis Presley’s “All Shook Up,” but Jerry Lee Lewis’ “Whole Lotta Shakin’ Goin’ On” will also do). Serve in a small high-ball or Delmonico glass. To sample one firsthand, and to celebrate New Orleans’ rich cocktail history (and aid in its renaissance), please come to Tales of the Cocktail, July 18-23d in the French Quarter, where legendary New Orleans bar man Chris McMillian and I will conduct a seminar on this and other Crescent City classics. For more information on this classic cocktail, see excellent articles here and here. 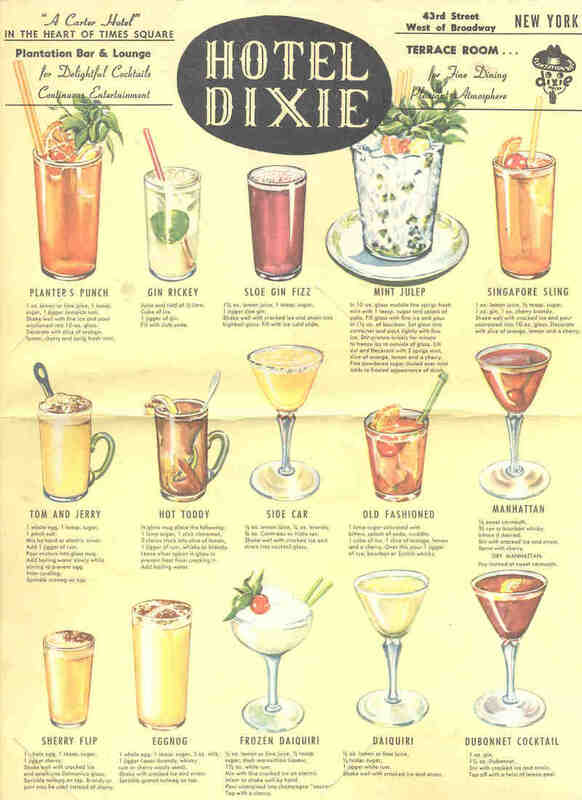 This is the first of what I hope will be many blogs showcasing vintage cocktail menus, fabled old venues, classic old drinks and the great old drinkers. 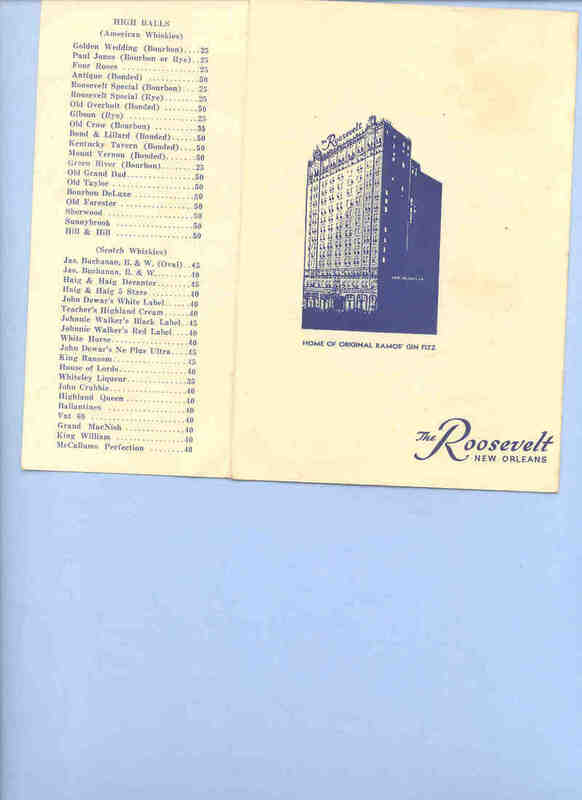 Today I’ll look at a couple of vintage menus from the old Roosevelt Hotel New Orleans. 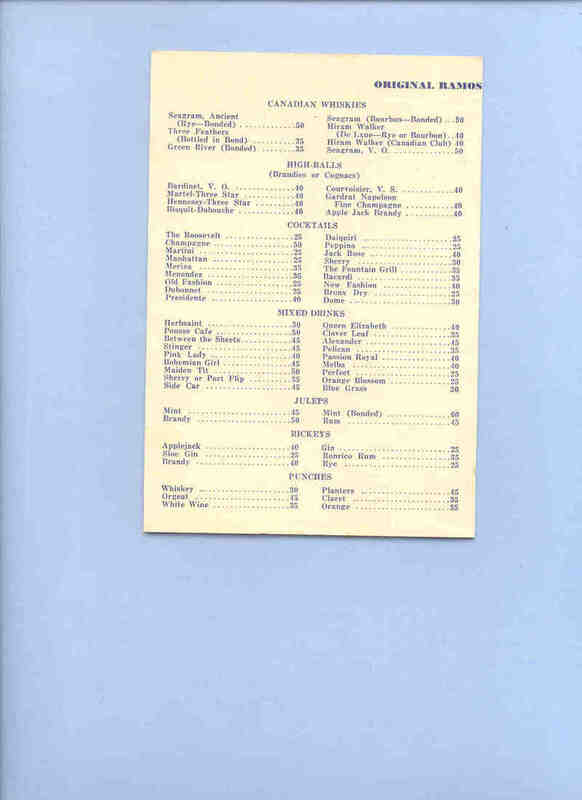 One, resembling the Ramos Gin Fizz itself, is dated 1951, while the “Bar… Suggestions” menu is likely pre-WWII. 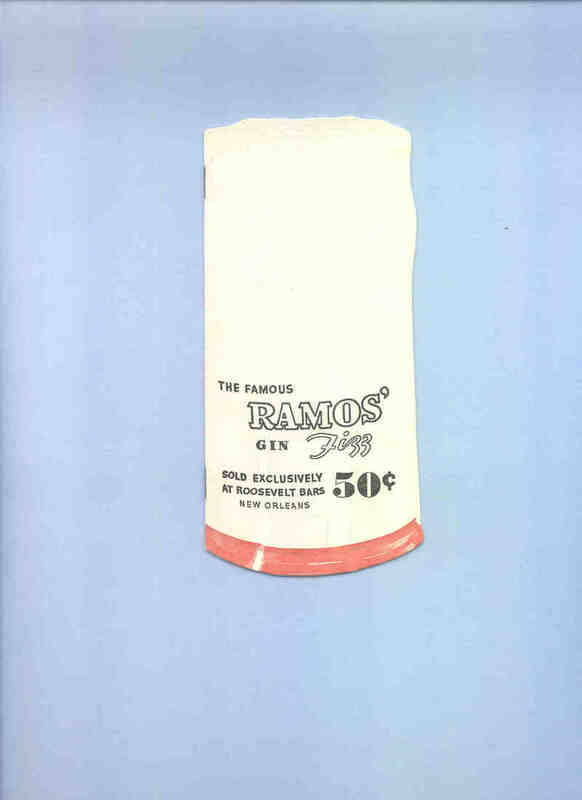 A Ramos Gin Fizz for 30 cents! A Martini for 25 cents! If there were ever a good reason to perfect time travel, this is it. What’s “ropy?” To paraphrase Supreme Court Justice Potter Stewart’s definition of obscenity, I can’t define it, but having made many Ramos Gin Fizzes, I know it when I see it (apologies are offered to my former law professors at Loyola New Orleans, but I’m sure they understand). The Ramos was invented by a guy named, you guessed it, Ramos (RAH-mose). 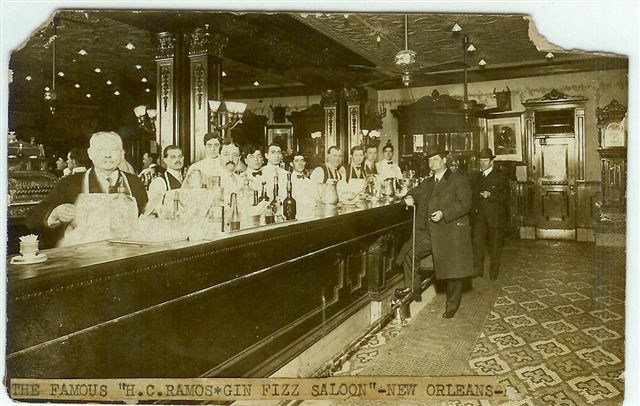 In 1888, Henry Ramos (his friends called him Carl) purchased a New Orleans saloon called the Imperial Cabinet, where the drink was likely born. In 1907, Henry moved to another New Orleans bar, the Stag, on Gravier near St. Charles. The drink became so popular that during the 1915 Mardi Gras, the Stag employed 35 “shaker boys” behind the bar. If a shaker boy tired, he’d toss his shaker to the one behind him to carry on. Whole lotta shakin,’ indeed. Prohibition came in 1919, and the honorable Henry Ramos closed his bar, unlike most Orleanians, who scoffed at the Volstead Act. Indeed, New Orleans held a dubious distinction in the eyes of Prohibition agent extraordinaire Izzy Einstein. Einstein traveled the country searching for speakeasies and other scofflaws, and would record the time it took for him to procure illegal hooch. In D.C., it took an hour; in Atlanta, 17 minutes; and in Pittsburgh, it took only 11. In New Orleans? 35 seconds. Izzy got off the train, hopped in a cab, asked where he could get a drink, and the obliging cabbie produced a flask. You see, New Orleans’ legendary status in the hospitality field is not a recent invention, it’s hard-wired. Henry Ramos died in 1928; the Noble Experiment still had another 5 years to run. But while he closed his saloon, he published his secret recipe, as a gift to the ages, or perhaps his own method of civil disobedience? 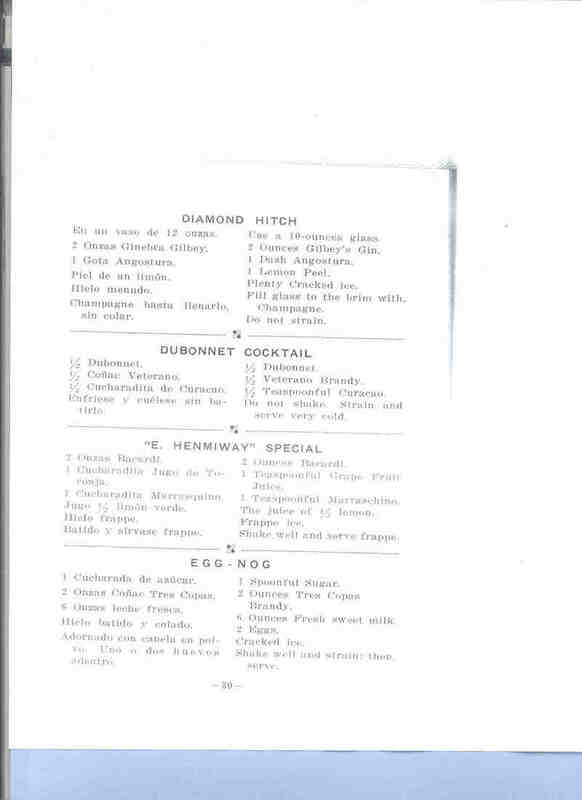 So, when Prohibition ended in 1933, New Orleans’ bartenders knew how to make the previously proprietary drink. Which brings us to the Roosevelt. 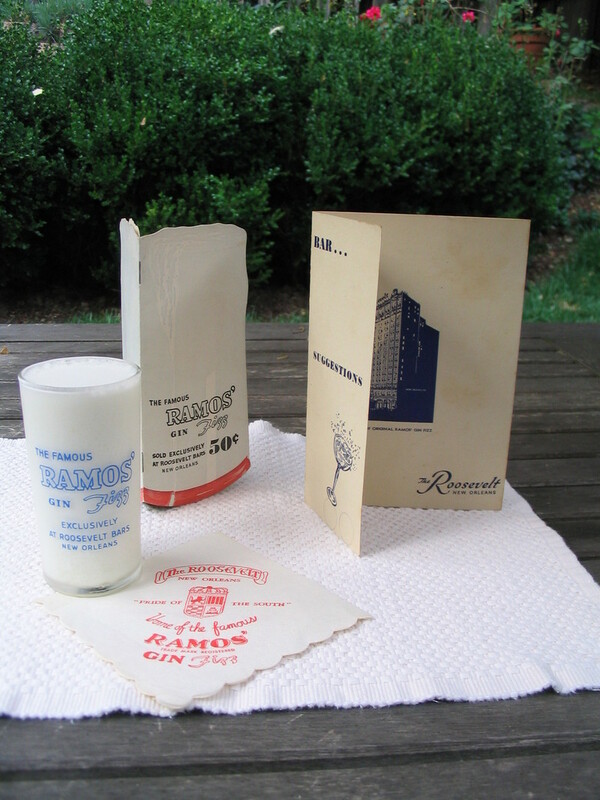 The Ramos Gin Fizz was one of several “house” drinks at the old Roosevelt Hotel Bar in New Orleans back in the day. 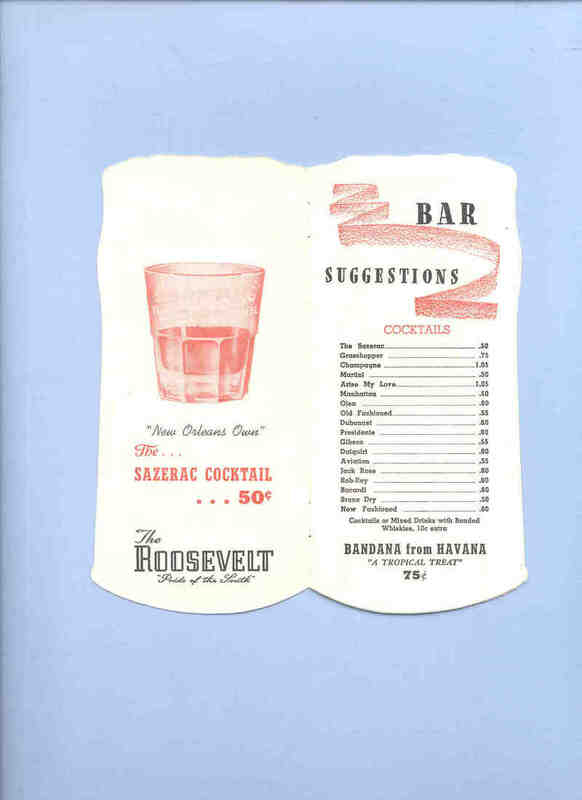 The Roosevelt made a practice of “adopting” great old New Orleans drinks that had lost their home, another example being the Sazerac (invented by my ancestor Antoine Peychaud in his pharmacy, probably in the 1850s, and perfected at the Sazerac House in the 1870s). The hotel, originally called the Grunewald, opened in 1893, and featured a subterranean-motif nightclub called “The Cave” (quite possibly America’s first nightclub). It became The Roosevelt (named for Teddy) around the time of WWI and in 1965, the Fairmont New Orleans (One of many Katrina casualties, it is currently closed). While the Ramos does contain quite a few ingredients, they’re standard: lemon juice, lime juice, cream, gin, egg white, sugar, seltzer. And then there’s orange flower water, easily available at Amazon.com, among other places. The orange flower water offers a floral bouquet not unlike that found in a glass of viognier wine. Indeed, its inclusion in a Ramos has prompted the classic line, “It’s like drinking a flower!” Whether or not you add vanilla extract is up to you - Orleanian bartenders have long debated the use of “the twin drops of extract wrung from the heart of the vanilla bean,” as Arthur called it. Like the issue of shaking or stirring a Martini, or crushing or merely bruising the mint in a julep, this is yet another controversy in the hornet’s nest that is mixology. Make a Ramos Gin Fizz and understand why the drink became the obsession of the Louisiana Kingfish, Senator Huey Long. Huey loved to drink, but trouble often found him when he did. One evening in 1933, Huey was out with friends at the Sands Point Casino night club on Long Island. With several Sazeracs under his belt, Huey made a spectacle of himself, eating food off other patrons’ plates, dragging women out on to the dance floor, and generally behaving like a dog. During a visit to the men’s room, unable to find an empty urinal, Huey proceeded to take aim between the legs of one of the men standing before him. His aim was not the best, and it netted Huey a cut above his eye seen in photos that graced the tabloid newspapers for days. So, in hopes of improving his image for the Presidential election of 1936, Huey decided to go “on the water wagon.” But he fell off that wagon during a trip to New York in July, 1935, and it was the Ramos Gin Fizz that prompted the fall.